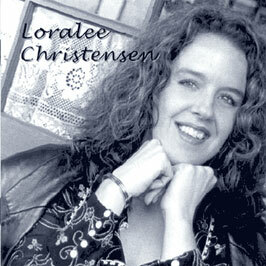 Loralee Christensen and Dennis Geyer "I'm Here For You"
Loralee Christensen has been a working musician, a professional singer, in bands, in recording sessions and on advertising jingles for more than 20 years. So how come she isn't more well known? Probably because she's one of those talented working musicians content to perform quietly and well on the local scene without ever making it to the big time. Or maybe she's just never gotten the break she deserves. 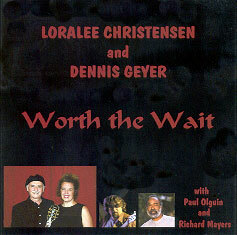 In any case, more people need to hear her CDs with singer/songwriter Dennis Geyer, 2004's "Worth the Wait," and their new one, "I'm Here For You." Christensen, who lives in Petaluma, once sang with the band About Face, among many others, and her three-octave voice, if not her name, is familiar on commercials for Mazda, Taco Bell and the Giants. 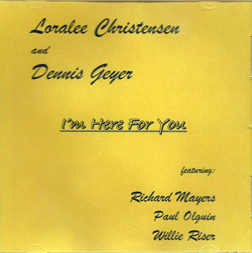 "I'm Here For You" is an entertaining mix of tasteful covers --- like Goffin/King's "Will You Still Love Me Tomorrow," Journey's "Lights" and the Lennon/McCartney soul stirrer "Oh Darlin'" --- and intelligent, clever songs for grownups written by Geyer, who played for years with the zydeco star Queen Ida. He adds vocals and guitar. Five of the 11 tracks are his originals. "The First Time I've Made Love In Years" is not only a terrific title, the song is a smart, sweet, simple ballad that Christensen sings in the worn voice of a woman who's been around the block, but is still capable of being open to a surprise love affair. Her worldly vocal is backed only by Geyer's lightly amplified guitar. "The Women Were Hot and the Beer Was Cold" has Geyer and Christensen trading vocals in a classic male/female barroom boogie, lamenting the days when they were young and could stay up all night drinking and trying to get into each other's pants. Both CDs are nicely spare instrumentally, with the vocals ably supported by Geyer's guitar, bassists Paul Olguin and Willie Riser sharing duties on "I'm Here For You," and percussionist Richard Mayers, who also plays harmonica. It's taken me 20 years to discover these two. But as the title of their previous CD suggests, it's been worth the wait. Click on underlined titles to hear samples!